There is no comprehensive Partnership Act in South Africa. The law of partnership in South Africa consists of South African common-law. Without an agreement, you leave your interest in your business at great risk to being devalued by the actions of your partner. 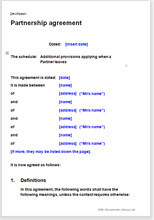 A good agreement must include paragraphs that set out in greater detail how your business will work.Other partnership agreements on the Internet, particularly ‘short’ versions, might cover the basics to form a partnership, but they aren’t likely to protect your interest in your new business sufficiently. Far more issues are considered in this document than in any other template we have seen.